Awareness; Etiology; Case Management; Gestational Anemia. Objectives: We conducted this study to assess the risk factors of gestational anemia and evaluate the effectiveness of a culturally-tailored nutrition educational intervention on hemoglobin (Hb) status among pregnant Omani women. Newborn birthweight was used as a birth outcome. Methods: The study was conducted in two phases. The first phase investigated the risk factors associated with gestational anemia in 206 Omani women who were ≥ 20 years old and had at least completed 12 weeks of gestation. A suitable sample was recruited at a tertiary teaching hospital in Muscat, Oman. Hb status was recorded, and backward linear regression was used to analyze the demographic and obstetric variables associated with Hb levels. In the second phase, a specially designed culturally-tailored nutrition educational intervention was delivered to women in the study group by trained research assistants whereas women in the control group received routine care only. The Hb levels of the pregnant women and birth weight of newborns after the intervention were evaluated in the second phase of the study. Results: The prevalence of gestational anemia among 206 pregnant Omani women was 41.7%. A significant negative relationship was found between Hb and parity whereas a positive relationship was found between Hb and gestational age. The Hb level increased as the gestational age advanced (β = 0.31, p < 0.050) and decreased as the parity increased (β = -0.22, p < 0.050). The pre-post mean difference of Hb levels in the study group was 11.0 g/dL and in the control group was 10.7 g/dL. The difference between the pre- and post-test Hb levels for the study group was significant (t = 3.58, p = 0.001), indicating that the culturally-tailored nutrition education intervention was effective in improving the Hb level in pregnant Omani women. No significant difference was found between the study and control group with respect to birth outcomes. Conclusion: The prevalence of gestational anemia is high in pregnant Omani women. The use of a specially designed culturally-tailored nutrition education intervention for pregnant women supplemented with follow-up reminders can reduce the occurrence of gestational anemia. Such programs are ultimately necessary in light of the high prevalence of gestational anemia in developing countries. The WHO estimates the prevalence of gestational anemia at 41.8%, with the highest prevalence rate among pregnant women in Africa and South East Asia (61.5% and 52.5%, respectively).8,9 Among pregnant women aged between 15 and 49 years, the prevalence of anemia in Central Asia, the Middle East, and North Africa in 2011 was 31%.10 In Oman, the prevalence of gestational anemia has reduced slightly from 34.4% to 34.1%.11 However, gestational anemia remains a major healthcare concern. Various strategies have been adopted by countries and international health agencies to decrease the prevalence of gestational anemia. Many interventions have been espoused such as iron supplementation, fortification of food with iron, malaria control, and deworming to reduce the occurrence of anemia.12 However, gestational anemia remains a challenge to healthcare providers in Oman. Educational interventions have successfully changed the knowledge and attitude of pregnant women towards increased adherence to anemia medication, which has led to a reduction in the prevalence of anemia.13,14 Additionally, a Cochrane review concluded that daily oral iron supplements improve hematological indices.15 Data concerning educational programs for gestational anemia and their outcomes in Oman is scarce. This study was conducted to examine the effectiveness of an exclusively designed culturally-tailored nutrition education intervention for the Hb status in pregnant women, as well as determine neonatal birthweight as an outcome measure among pregnant women who underwent the nutrition education intervention. Figure 1: The transtheoretical model of health promotion. This study sought to investigate the risk factors of gestational anemia and assess the effectiveness of a culturally-tailored nutrition education intervention designed for pregnant women concerning their Hb status and birth outcomes. The study was conducted in two phases over a period of 18 months at a tertiary referral hospital serving the whole of Oman. In the first phase of the study, 206 pregnant women at 12 weeks of gestation were recruited after obtaining their informed consent. Sample size was calculated using Mahajan’s formula. Data was collected from January 2014 to June 2015 using the convenient sampling technique. The study included pregnant Omani women ≥ 20 years old who had completed at least 12 weeks of gestation. The women were assessed for their baseline Hb levels. Pregnant women whose Hb level was < 8.0 g/dL and > 11.0 g/dL were excluded from the study. The reason for exclusion of pregnant women with Hb levels < 8.0 g/dL was the requirement for these women to receive a blood transfusion in accordance with hospital policy. Pregnant women were recognized to have gestational anemia if their Hb level was > 8.0 g/dL or < 11.0 g/dL. The cutoff point for gestational anemia was based on WHO and CDC standards.1,2 Women with sickle cell anemia and thalassemia were excluded from the study. After identifying women with gestational anemia, 50 were selected as participants for the second phase of the study. Twenty-five of these participants were randomly assigned to a study group and 25 to a control group. In the second phase of the study, at 24 weeks gestation, the pregnant women with gestational anemia in the study group were given a culturally-tailored nutrition education intervention. The nutrition education intervention was continued until 36 weeks gestation. During the period from 24 to 36 weeks gestation, every fourth week, follow-up reminders were sent to the women in the study group to enhance their knowledge of the prevention and management of gestational anemia. The nutrition education intervention for the prevention and management of anemia also was shared with the pregnant women in the study group by distributing pamphlets. The pregnant women in the control group continued to get routine hospital care, only. On completion of 36 weeks of gestation, the Hb levels of the pregnant women were assessed in both the study and control groups. On delivery, the birth weight of newborns from both groups was compared. Ethical clearance was received from the Research and Ethics Committee of College of Nursing, Sultan Qaboos University, as well as the data collection setting. All data sheets were coded and kept under lock and key by the principal investigator. A self-administered instrument was developed and validated by the researchers who documented the sociodemographic data, including age, educational status, occupation, and body mass index (BMI) as well as obstetric data comprising gestational age, gravida, parity, pregnancy gap, and number of abortions. Birth weight was considered as an outcome variable of the study. The data collection instrument was tested for its reliability using Cronbach’s alpha. The reliability of the study instrument was 0.80. The study instrument was found to be sufficiently reliable to proceed further in the data collection process. The study investigator developed a specially designed culturally-tailored nutrition education intervention. The interventional package comprised of a PowerPoint presentation with information about the dietary management of anemia, which included an awareness of choosing iron-rich foods, the importance of compliance to iron supplementation as well as a pamphlet that covered information about gestational anemia and its effect on pregnant women and newborns. The content of the nutrition education intervention was developed by the researchers, who are experts in the field, and was further guided by a literature review. A bilingual language expert translated the content of the educational intervention into Arabic and back translated to English to ensure the validity of the translation. After translation and back translation, the interventional package was authenticated by five experts and the fidelity of the intervention was tested. After assuring the validity of the intervention, the latter was administered to the participants. The educational intervention was steered as a 30-minute session in a personalized manner. Each session was supplemented with a Microsoft PowerPoint presentation and a pamphlet, which was provided to consolidate and enrich the information. Participants were given an opportunity to discuss the content of the educational intervention, so any doubts were clarified. Additionally, knowledge was further consolidated every four weeks through infographics sent to participants via WhatsApp as a platform to enhance and retain the knowledge gained until the completion of 36 weeks gestation. All research assistants in this study were nurses. They were deemed competent to carry out the data collection and to administer the educational intervention. Training of research assistants was carried out to enhance the rigor of the study and to limit the threat to validity. Training included familiarization with each survey tool item and educational materials; this ensured that the processes of data collection and administration of the education intervention were delivered with consistency in quality and content. The research team delivered a mock session for the educational intervention to the research assistants. This enhanced and assured the fidelity of the intervention. In the first phase of the study, 206 pregnant women at 12 weeks of gestation who consented to participate in the study were assessed for their Hb levels during routine antenatal screening by the obstetrician. In the second phase of the study, 50 pregnant women who were known to have gestational anemia and who consented to participate in the study, were chosen to participate. The participants were then randomly assigned to control and study groups comprising 25 antenatal mothers in each group. In this phase, the pregnant women assigned to the control group were allowed to leave the antenatal outpatient department after receiving routine antenatal care. The women assigned to the study group participated in the nutrition educational intervention organized by trained research assistants. The study group continued to receive the educational intervention through WhatsApp reminders via infographics about the prevention and management of anemia until the completion of 36 weeks gestation. The researchers also followed the pregnant women’s antenatal check-up schedule by verifying the health records through the records system and ensured that the participants followed their appointment dates through phone reminders. At 36 weeks gestation, post-test Hb levels were recorded for all participants of the study and control groups. After delivery, the birth weight of the newborn for women in both groups was recorded to measure the birth outcome of the study. Data entry and cleaning was carried out before the data was analyzed. Data analysis was done using SPSS Statistics (IBM Corp. IBM SPSS Statistics for Windows, Version 21.0. 2012). In phase I, frequency and percentage distributions were used to analyze the demographic data, prevalence of gestational anemia, and characteristics of participants which included risk factors for gestational anemia. A backward multivariate linear regression model was then employed to gauge the degree of association between Hb levels with sociodemographic factors and obstetric variables. Income level was excluded from the regression analysis since only 72 participants out of 206 responded with income information. In Phase II, a t-test was used to assess the pre- and post-interventional difference in the Hb levels of both groups. The mean birth weight of newborns for each group was also computed using t-test. Phase I of the study assessed the risk factors of gestational anemia among pregnant Omani women. The mean Hb level for the sample of 206 pregnant women was 11.2±1.1 g/dL, ranging from 9.0 g/dL to 14.2 g/dL; 41.7% of the pregnant women were anemic, and 68.2% of the mothers identified to have anemia were between 25 and 34 years of age [Table 1]. Of the 206 pregnant women, 38.8% belonged to the 25–29 age group, 48.8% of pregnant women had at least a higher secondary level of education, and 73.3% of women were overweight. The largest fraction of the sample (41.7%) had a household income between 500 and 999 Omani Rials (approximately US$1300–2600). Most women were multiparous, and a large majority of mothers had at least one prior pregnancy [Table 1]. Table 1: Prevalence and risk factors for anemia. BMI: body mass index;* p < 0.050.
aIncome (in Omani rials) level was excluded from regression analysis; only 72 participants provided income information. All variables except parity and gestational age were excluded during the backward regression analysis. The results showed that women had increased Hb levels if the gestational age was higher (β = 0.31, p < 0.050), and the Hb levels decreased if the parity increased (β = - 0.22, p < 0.050). Five participants from the control group and six from the study group were considered ‘dropouts’ as these pregnant women could not continue to participate in the study due to preterm labor and high-risk conditions such as placenta previa and pregnancy-induced hypertension. After taking into account the number of dropouts in the study, there were 20 women in the control group and 19 women in the study group comprising a total of 39 women who participated in Phase II of the study. The descriptive results showed a significant difference in the mean post-test Hb levels of the study (11.0 g/dL) and control (10.7 g/dL) groups [Table 2]. The Hb levels were higher in the study group in which the culturally-tailored nutrition education intervention was provided and administered. However, the t-test showed that this difference was not statistically significant (t = -0.68, p = 0.620). The mean newborn weight of 2.9 kg for the control group was slightly higher than the mean newborn weight of 2.8 kg for the study group [Table 2]. This difference was also not statistically significant (t = 0.86, p = 0.640). Comparing each group, the difference in mean pre-test and post-test Hb levels was higher for the study group (1.1 g/dL) relative to the control group (0.5 g/dL) [Table 3]. In this case, the t-test showed that the difference between mean pre-test and post-test Hb levels for the study group was higher and statistically significant (t = 3.58, p = 0.001), while it was lower and was not statistically significant for the control group (t = 1.77, p = 0.085). Table 2: Differences in mean hemoglobin (Hb) levels and newborn weight between control and study groups. Table 3: Differences between pre-test and post-test mean hemoglobin (Hb) levels within control and study groups. According to the WHO, gestational anemia is a common worldwide health problem.1 Gestational anemia has been estimated to affect 38% (32 million) of pregnant women globally. This study attempted to identify the possible risk factors for gestational anemia among pregnant women, including age, BMI, educational and income level, gravidity, parity, and gestational age. However, other than parity and gestational age, other factors were not found to have any significant associations with Hb status. Hb levels were higher in women whose gestational age was more advanced (β = 0.31, p < 0.050) and Hb levels were lower in pregnant women with multiparity (β = -0.22, p < 0.050), which proves that the extent of anemia becomes more detrimental with increasing parity. These findings are consistent with previous studies done in Oman and other countries. In a study conducted in Bidbid, a town close to Oman’s capital Muscat, it was noted that increasing parity demonstrated an increase in the risk of occurrence of gestational anemia in a dose-response fashion.24 Many factors account for this high prevalence of anemia among pregnant women. A study in Kuwait demonstrated that the common and significant risk factors for anemia during pregnancy were improper dietary habits, menorrhagia, short birth spacing, irregular or no supplementation with iron-folate tablets, ingestion of non-steroidal anti-inflammatory drugs or antacids, not consuming fruit juice, and high consumption of bread, tea, and coffee.25 Understanding the risk factors involved in these communities assisted and directed the research team in the development of a culturally-tailored nutrition educational intervention, which was intended to prevent and reduce the incidence of gestational anemia among pregnant women in Oman. We provided women in the study group with a culturally-tailored nutrition education intervention about gestational anemia, and the effect of this nutrition education intervention on the women’s Hb status was investigated. The results revealed a significant difference in the mean post-test Hb levels of the study (11.0 g/dL) and control (10.7 g/dL) groups, which were thought to be in response to the administration of a culturally-tailored nutrition education intervention to the pregnant women of the study group. However, the t-test showed that this difference was not statistically significant (t = -0.68, p = 0.620). The mean newborn weight for the control group (2.9 kg) was slightly higher than the study group (2.8 kg), but this difference was not statistically significant (t = 0.86, p = 0.640). The study considered the importance of patient education as suggested by Powell and Thurston,26 and incorporated the TTM in the development and evaluation of the education program. The program was designed to focus on encouraging behavior change through awareness of gestational anemia, the risk associated with gestational anemia, and the benefits of following healthy food habits to prevent gestational anemia. Further knowledge enhancement was achieved through prompts which were sent via WhatsApp infographic messages to pregnant women of the study group. The results showed that the incidence of anemia was higher for women who were 12 weeks pregnant. The results of the second phase provide evidence that the educational intervention improved Hb status and birth outcomes. Comparing each group, the difference in mean pre-test and post-test Hb levels was higher for the study group (1.1 g/dL) relative to the control group (0.5 g/dL). The t-test showed that the difference between mean pre-test and post-test Hb levels in the study group was higher and statistically significant (t = 3.58, p = 0.001), while it was lower and not statistically significant for the control group (t = 1.77, p = 0.085). The mean post-test Hb level in the study group was significantly higher than that of the control group, suggesting that a culturally-tailored nutrition education intervention with constant reinforcement through WhatsApp can be a significant factor in improving the status of Hb in pregnant women. Reenforcement, good communication, and the provision of educational information are strategies shown to enhance compliance with iron supplementation.27 Our research suggests that a one-time educational program for the pregnant women may not be sufficient to adhere to the advice given with respect to the prevention and management of gestational anemia and that education needs to be continuous throughout the pregnancy. Retention of information about anemia prevention may be difficult for women over longer periods, and reinforcement helps retention of information as well as adherence to healthy behavior. Utilizing messaging technology to remind mothers was found to be both effective and beneficial in this study. This study is comparable to studies carried out in other countries such as India, Egypt, and Palestine where educational program improved knowledge about gestational anemia in antenatal mothers and improved their Hb status and pregnancy outcomes.28–30 The study also suggests that interventions to reduce the risk of gestational anemia must include elements of family planning since increasing parity was found to be a significant risk factor. Additional studies should be carried out to explore the risk between gestational anemia and spacing of pregnancies. There is a lack of culturally-sensitive antenatal educational sessions for antenatal women in developed and developing countries. In such countries it becomes the responsibility of doctors, midwives, and nurses to educate mothers about gestational anemia and its consequences, and to implement a remediation plan which can improve the women’s preventive practices and health seeking behavior. As gestational anemia is a public health problem, the healthcare team need to overcome challenges to ensure that there is a better place for the antenatal mothers to learn and have healthy antenatal and neonatal outcomes, while empowering mothers to take responsibility for their health. The investigators of the study collectively suggest having an antenatal education unit in hospitals catering to antenatal mothers, where mothers will be motivated through education and reinforcement with the relevant, evidence-based information about care during pregnancy. Additionally, the study recommends having gestational anemia education at family planning clinics, and that educational services for gestational anemia should include elements of family planning to reduce the risk of anemia from increasing parity and gravidity. Any such culturally-tailored nutrition educational interventions would benefit from proactive follow-up through social media platforms to consolidate and enhance the knowledge of healthy practices to prevent gestational anemia. The study also recommends that these interventions should undergo constant evaluation through monitoring studies to improve upon various aspects, such as content and mode of delivery. The small sample size of our study can be considered a limitation thus making it difficult to generalize the study findings; however, the study can be considered as preliminary research with a view to conducting further studies in Oman. Gestational anemia is common in Omani pregnant women, and educational intervention can help towards a better understanding of the problem and the risks for mother and child, as well as positively impact its outcome. It is the responsibility of the healthcare providers to enhance the health and well-being of antenatal women by giving importance to primary and secondary preventive measures. The authors declared no conflict of interests. This study was funded by the Research Grant, Sultan Qaboos University (Project No.9IG/CN/MCHH/13/01). 1. World Health Organization. Worldwide prevalence of anaemia 1993-2005. WHO Global Database on Anaemia. Geneva; 2008. 2. Centers for Disease Control (CDC). CDC criteria for anemia in children and childbearing-aged women. MMWR Morb Mortal Wkly Rep 1989 Jun;38(22):400-404. 3. Sharma JB. Nutritional anemia during pregnancy in non-industrial countries. Progress in Obst & Gynae (Studd) 2003;15:103-122. 4. Milman N. Anemia–still a major health problem in many parts of the world! Ann Hematol 2011 Apr;90(4):369-377. 5. Lozano R, Naghavi M, Foreman K, Lim S, Shibuya K, Aboyans V, et al. Global and regional mortality from 235 causes of death for 20 age groups in 1990 and 2010: a systematic analysis for the Global Burden of Disease Study 2010. Lancet 2012 Dec;380(9859):2095-2128. 6. Liu L, Johnson HL, Cousens S, Perin J, Scott S, Lawn JE, et al; Child Health Epidemiology Reference Group of WHO and UNICEF. Global, regional, and national causes of child mortality: an updated systematic analysis for 2010 with time trends since 2000. Lancet 2012 Jun;379(9832):2151-2161. 7. Murray-Kolb LE. Maternal mortality, child mortality, perinatal mortality, child cognition, and estimates of prevalence of anemia due to iron deficiency. Baltimore: CHERG; 2012. 8. Levy A, Fraser D, Katz M, Mazor M, Sheiner E. Maternal anemia during pregnancy is an independent risk factor for low birthweight and preterm delivery. Eur J Obstet Gynecol Reprod Biol 2005 Oct;122(2):182-186. 9. Ejeta E, Alemnew B, Fikadu A, Fikadu M, Tesfaye L, Tessema TB. Prevalence of anaemia in pregnant women and associated risk factors in Western Ethiopia. Food Science and Quality Management; 2014. 10. Stevens GA, Finucane MM, De-Regil LM, Paciorek CJ, Flaxman SR, Branca F, et al; Nutrition Impact Model Study Group (Anaemia). Global, regional, and national trends in haemoglobin concentration and prevalence of total and severe anaemia in children and pregnant and non-pregnant women for 1995-2011: a systematic analysis of population-representative data. Lancet Glob Health 2013 Jul;1(1):e16-e25. 11. The World Bank. Oman Data. 2015 [cited 2015 December 20]. Available from: http://data.worldbank.org/country/oman (2015). 12. Peña-Rosas JP, De-Regil LM, Dowswell T, Viteri FE. Intermittent oral iron supplementation during pregnancy. Cochrane Database Syst Rev 2012 Jul;7(7):CD009997. 13. Nagata JM, Gatti LR, Barg FK. Social determinants of iron supplementation among women of reproductive age: a systematic review of qualitative data. Matern Child Nutr 2012 Jan;8(1):1-18. 14. Garg A, Kashyap S. Effect of counseling on nutritional status during pregnancy. Indian J Pediatr 2006 Aug;73(8):687-692. 15. Reveiz L, Gyte GM, Cuervo LG, Casasbuenas A. Treatments for iron-deficiency anaemia in pregnancy. Cochrane Database Syst Rev 2011 Oct;10(10):CD003094. 16. Prochaska JO. Strong and weak principles for progressing from precontemplation to action on the basis of twelve problem behaviors. Health Psychol 1994 Jan;13(1):47-51. 17. Noar SM, Zimmerman RS. 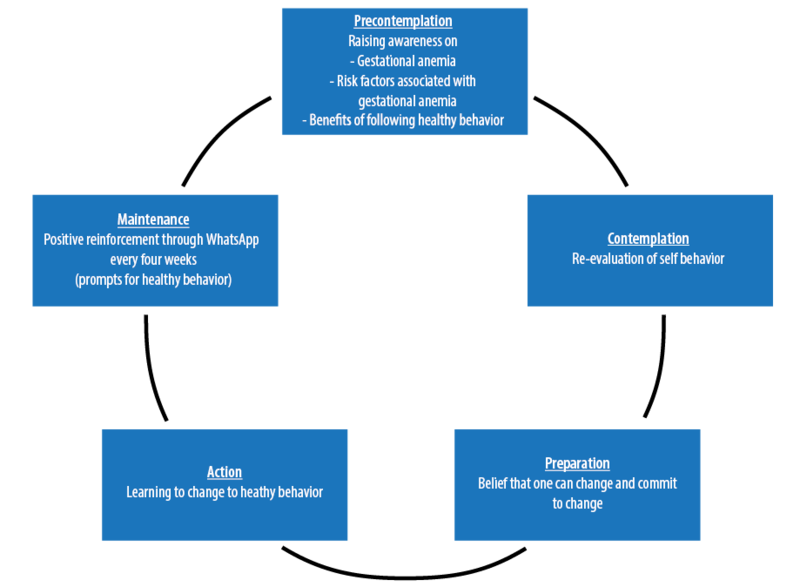 Health Behavior Theory and cumulative knowledge regarding health behaviors: are we moving in the right direction? Health Educ Res 2005 Jun;20(3):275-290. 18. Prochaska JO, DiClemente CC, Norcross JC. In search of how people change. Applications to addictive behaviors. Am Psychol 1992 Sep;47(9):1102-1114. 20. Al-Haddabi R, Al-Bash M, Al-Mabaihsi N, Al-Maqbali N, Al-Dhughaishi T, Abu-Heija A. Obstetric and perinatal outcomes of teenage pregnant women attending a tertiary teaching hospital in oman. Oman Med J 2014 Nov;29(6):399-403. 21. Noronha JA, Khasawneh E, Seshan V, Ramasubramaniam S, Raman S. Anemia in pregnancy-consequences and challenges: a review of literature. J South Asian Fed Obstet Gynecol 2012;4(1):64-70 . 22. Seshan V, Alkhasawneh E, Al Hashmi I. Risk factors of urinary incontinence in women: a literature review. Int J Urol Nurs 2016 Jan;10(3):118-126 . 23. Al-Khasawneh EM, Ismayilova L, Seshan V, Hmoud O, El-Bassel N. Predictors of human immunodeficiency virus knowledge among Jordanian youths. Sultan Qaboos Univ Med J 2013 May;13(2):232-240. 24. Alkhasawneh E, Ismayilova L, Olimat H, El-Bassel N. Social and behavioural HIV/AIDS research in Jordan: a systematic review. East Mediterr Health J 2012 May;18(5):487-494. 25. Al-Farsi YM, Brooks DR, Werler MM, Cabral HJ, Al-Shafei MA, Wallenburg HC. Effect of high parity on occurrence of anemia in pregnancy: a cohort study. BMC Pregnancy Childbirth 2011 Jan;11:7. 26. Ahmed F, Al-Sumaie MA. Risk factors associated with anemia and iron deficiency among Kuwaiti pregnant women. Int J Food Sci Nutr 2011 Sep;62(6):585-592. 27. Powell K, Thurston M. Commissioning training for behaviour change interventions: evidence and best practice in delivery. Chester: Centre for Public Health Research; 2008. 28. Osterberg L, Blaschke T. Adherence to medication. N Engl J Med 2005 Aug;353(5):487-497. 29. Noronha JA, Bhaduri A, Bhat HV, Kamath A. Interventional study to strengthen the health promoting behaviours of pregnant women to prevent anaemia in southern India. Midwifery 2013 Jul;29(7):e35-e41. 30. Al-tell MA, El-Guindi FK, Soliman NM, El-Nana H. Effect of nutritional intervention on anemic pregnant women’s health using health promotion model. Med J Cairo Univ 2010 Mar;78(2):109-118. 31. Gadallah M, Rady M, Salem B, Aly EM, Anwer W. The effect of nutritional intervention program on the prevalence of anemia among pregnant women in rural areas of Belbis district-Sharkia Governorate-Egypt. J Egypt Public Health Assoc 2002;77(3-4):261-273. 32. United Nations. Sustain development goals. Goal 3: Ensure healthy lives and promote well-being for all at all ages 2015 [cited 2016 April 11]. Available from: http://www.un.org/sustainabledevelopment/health/.